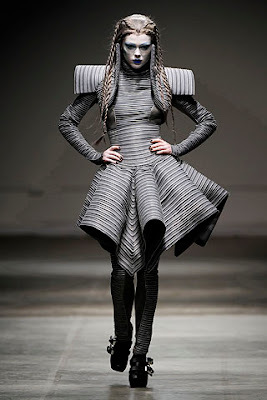 English fashion designer Gareth Pugh showed his spring collection at Paris Week recently. How stunning are these architectural pieces? In my search to learn more about him, I came across this excerpt fromWikipedia. ouch! "Though he is currently a darling of the fashion elite, Pugh claimed in March 2007 that he had yet to sell a single dress and that he struggled to make ends meet. (Until his Spring 2007 collection, his clothes were solely catwalk experiments and simply unavailable to purchase.) While constructing his autumn 2005 debut collection, shown in the Fashion East group show, he was squatting in a converted warehouse. (A court order ultimately forced him to leave the building.) He says his current studio is unheated and has only two electrical outlets. 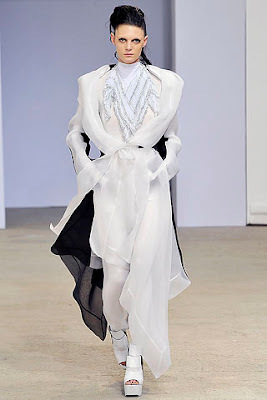 It remains to be seen whether Pugh can be a commercial success as well as a critical one, but he is slowly shifting to more wearable clothing in his runway showsand he has partnered with major manufacturers to produce some of his new pieces." More of his collections here.